Treat a friend or loved one to great services and products! Great products are available to support you and your child as you learn American Sign Language. Scroll through the list below to see what's available including DVD's, books, posters/placemats, flashcards, and reference guides. Sign 2 Me & Northlight Communications, Inc. Created especially for parents and caregivers looking for fun ways to introduce signs to their children, Pick Me Up! is the exciting new Music CD and Activity Guide from Sign2Me! This collection of 20 original songs features a rich variety of musical styles – ranging from jazz, calypso, and reggae to country, rock, and soul – music that engages children's bodies as well as their minds. Complimenting the Music CD, the Pick Me Up! Activity Guide is a full-color reference companion, featuring more than 200 American Sign Language (ASL) illustrations. Each song has a corresponding activity, complete with lyrics, colorful sign illustrations, bonus signs for advanced signers, and signing advice from American Sign Language educator Dr. Joseph Garcia. Illustrates 54 of the most commonly-used signs. This attractive illustrated reference is designed to provide you with easy visual access to some of the most commonly-used and useful signs, helping you take advantage of the moments when your baby is ready to learn. It also gives you the means to monitor your baby's progress and to teach other caregivers (grandparents, babysitters, etc.) the signs your child already knows. Filled with anecdotes, practical guidelines, and humor, SIGN with your BABY® offers an effective way to teach parents and infants how to communicate through sign. Author Dr. Joseph Garcia helps you recognize when your child is receptive to learning, recommends which signs to teach first, and shares ideas for games that can be fun and useful when introducing new signs. With 109 pages and 145 clearly illustrated ASL signs, this book enables you to choose and teach the signs that will be most beneficial to you and your child. The SIGN with your BABY® DVD Training Video makes learning easy with instruction, demonstrations, and tips from author Dr. Joseph Garcia. It also features interviews with parents and caregivers who share their experiences and eye-opening footage of signing children. Feature rich menus allow viewers to quickly view sign demonstrations or locate specific scenes. You’ll be amazed when your baby signs! The Sign2Me® Flash Cards are designed to make it fun for everyone to expand their signing vocabulary. The front of each card displays a colorful illustration while the reverse side teaches users how to make the associated sign. Each card contains the ASL illustration for the sign along with the English and Spanish words and phonetic pronunciations giving the user the three most popular languages used in the United States. Quick Start: More, Milk, Eat, Finished, Mommy, Daddy, etc. Animals & Colors: Dog, Cat, Monkey, Red, Blue, Green, Color, etc. Family, Clothing, & Toileting: Grandma, Grandpa, Brother, Diaper, Change, Shirt, Shoes, etc. Actions & Opposites: Again, Sit, Sleep, On, Off, Hot, Cold, etc. Objects & Emotions: Airplane, Ball, Cup, Happy, Love, Sorry, etc. The Sign2Me® Reminder Series of ASL posters and Teaching Strategy Sheets serve as visual reminders to parents and caregivers by providing them quick visual reference to the most useful ASL signs for young children. Each Reminder Series set includes two colorful 17×11-inch posters and one Teaching Strategy Sheet, which provides developmentally appropriate suggestions for introducing signs into your daily routines and activities. Play Time Signs - activities and toys including 'swing', 'ball', and 'play'. Aggression Intervention Signs - including 'stop', 'share', and 'no'. Transition Signs - including 'ready', 'wait', 'line-up', and much more! Toileting & Diaper Changing Signs - including 'diaper', 'change', and 'potty'. Health & Safety Signs - including 'safe', 'careful', and 'no-touch'. Music Activities Signs - including 'music', 'listen', and 'watch-me'. Animal Signs - includes 'dog', 'monkey', 'tiger', 'fish', and more! This attractive illustrated reference is designed to provide you with easy visual access to some of the most commonly-used and useful signs, helping you take advantage of the moments when your baby is ready to learn. It also gives you the means to monitor your baby's progress and to teach other caregivers (grandparents, babysitters, etc.) the signs your child already knows. The first in the Signing Time! Series. Cousins Alex Brown (who can hear) and Leah Coleman (who is deaf) invite children of all ages to "Come sign with us!" My First Signs presents 18 basic American Sign Language (ASL) signs to your family in a fun and memorable way. It's Signing Time: My First Signs — ASL signs you can use everyday! DVD version includes sign review. Watch, enjoy and learn as Alex, Leah and all their friends share everyday signs. This award winning video will teach your family the signs that you need every day. Sign language made fun for the whole family. You won't be able to resist trying your hands at the Silly Pizza Song! 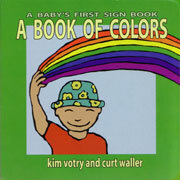 DVD version includes sign review and ASL tips. Join Alex, Leah, their frog Hopkins, and Signing Time's Rachel Coleman for more signing fun! Family, Feelings, & Fun teaches ASL signs for family members, feelings, and things outside. DVD version includes special features and ASL tips. Join Alex, Leah, their frog Hopkins, and Signing Time's Rachel Coleman for more signing fun! ABC Signs teaches the alphabet in American Sign Language, and introduces more than 50 signs for words corresponding to different letters. DVD version includes special features and ASL tips. oin Alex, Leah, their frog Hopkins, and Signing Time's Rachel Coleman for more signing fun! My Favorite Things teaches ASL signs for fruits, vegetables, colors of the rainbow, and activities. Everybody's happy down on Leah's Farm! Come join Rachel, Alex, Leah and their frog Hopkins as you learn more songs and signs for all your favorite barnyard animals and critters. Signs you will learn: farm - chicken - horse - goat - mouse - rooster - sheep - cow - donkey - pig - turkey - pet - cat - dog - fish - bird - squirrel - duck - rabbit - snail - frog - snake - lizard - turtle ...and more! Rachel, Alex, Leah, and their frog Hopkins invite you to explore The Great Outdoors. You will go on a singing and signing adventure as you learn the signs for animals, bugs, activities, and objects you encounter in your 'great backyard'. All Aboard! Let's get on the Zoo Train with Rachel, Alex, Leah and Hopkins and learn signs for all your favorite animals that you see (and sometimes don't see!) at the zoo. Signs you will learn: rhino - bats - seal - panda - hippo - zebra - tiger - lion - shark - dolphin - whale - octopus - crab - lobster - starfish - shrimp - monkey - kangaroo - camel - gorilla - crocodile - elephant - penguin - giraffe ...and more! Alex and Leah are ready to start their day with you! Come join Rachel and her young friends as you learn songs and signs for all your daily activities – waking up, getting dressed, playing, cleaning up, and going to bed. Rachel, Alex, Leah, and their frog Hopkins take you all around the town! My Neighborhood teaches signs and songs for playground activities, vehicles, places to go and people to see. Yum! Alex, Leah, Hopkins and Rachel invite you to breakfast, lunch, and dinner. The kitchen is a fun place to be! You will learn songs for cooking, eating, setting the table, and more of your favorite foods. Now learning time is Signing Time! Join Alex and Leah for a day at school as you learn the signs and songs about things to do and see in the classroom. Alex, Leah, their frog Hopkins, and Signing Time’s Rachel Coleman return for a second series of charming animation, delightful songs and children signing that make any time Signing Time! In Series Two, Volume 1: Nice to Meet You Rachel teaches signs that will help you make new friends and greet your old ones. Alex, Leah, their frog Hopkins, and Signing Time’s Rachel Coleman return for a second series of charming animation, delightful songs and children signing that make any time Signing Time! In Series Two, Volume 2: Happy Birthday To You you’re invited to Leah’s Birthday Party where you’ll learn the signs you need to know to join in the birthday fun! Alex, Leah, their frog Hopkins, and Signing Time’s Rachel Coleman return for a second series of charming animation, delightful songs and children signing that make any time Signing Time! In Series Two, Volume 3: Move and Groove you’ll learn all the signs you need to show to get movin' and groovin'. Alex, Leah, their frog Hopkins, and Signing Time’s Rachel Coleman return for a second series of charming animation, delightful songs, and children signing that make any time Signing Time! In My Favorite Season you'll sing and sign your way through the changing seasons. Which is your favorite season? Alex, Leah, their frog Hopkins, and Signing Time’s Rachel Coleman return for a second series of charming animation, delightful songs and children signing that make any time Signing Time! Let's go outside today! In Going Outside you'll learn signs for many of the beautiful things in nature. Alex, Leah, their frog Hopkins, and Signing Time’s Rachel Coleman return for a second series of charming animation, delightful songs and children signing that make any time Signing Time! In Days of the Week you’ll learn signs for the days of the week, and see what some families do on each day. You’ll also learn to sign first, second, third, and so on. Alex, Leah, their frog Hopkins, and Signing Time’s Rachel Coleman return for a second series of charming animation, delightful songs and children signing that make any time Signing Time! In My Favorite Sport you’ll learn signs for Alex and Leah’s favorite sports. What’s your favorite sport? We’re excited to announce the updated editions of Signing Time! Volumes 1–3. Available only on DVD, these videos have been remastered and repackaged to match the fun look and feel of volumes 4–13 as well as the hit public television series. Each volume still contains the same footage you’ve grown to love from the originals but with an updated look for Rachel and several special features including sign reviews, creators' commentary, behind-the-scenes footage and a music video of “Proud to be Me” on Volume 3 that is sure to have everyone in the family dancing around the house! The Volume 7-9 Gift set includes 3 DVDs + 1 music CD. Approximate run time: 30 minutes per DVD episode length plus approximately 15 minutes of special features per DVD! Music CD - songs from Volumes 10-12 - Sorry, songs from Volume 13 aren't available on CD yet. Alex, Leah, their frog Hopkins, and Signing Time’s Rachel Coleman return for a second series of charming animation, delightful songs and children signing that make any time Signing Time! Like Series One, Series Two will teach hearing children of all abilities fun, useful American Sign Language (ASL) vocabulary-building signs. In addition to its signature clever animation and new original songs from co-founder Rachel Coleman, Signing Time!, Series Two includes several new learning modules that not only put children’s ASL vocabulary to work but enhance their overall learning, communication, self-confidence, and verbal skills. My Favorite Season: Sing and sign your way through the changing seasons with My Favorite Season. Which is your favorite season? Includes a special feature on Holiday signs. Going Outside: Let's go outside today! In Going Outside you'll learn signs for many of the beautiful things in nature. Has a special feature including hilarious outtakes. Days of the Week: In Days of the Week you’ll learn signs for the days of the week, and see what some families do on each day. You’ll also learn to sign first, second, third, and so on. My Favorite Sport: In My Favorite Sport you’ll learn signs for Alex and Leah’s favorite sports. What’s your favorite sport? Includes an exclusive interview with Leah Coleman! This set also includes all four Signing Time Music CDs! Baby Signing Time sets your baby's day to music as you learn signs through song for everyday events - washing up, getting dressed, going places, getting ready for bed, and more. Designed specifically for babies 3-36 months old. Combines songs, animation, and signing babies age 2 and under to make signing easy and fun. Baby Signing Time is the perfect addition to your Signing Time collection for more reinforcement (and songs!) for those beginning signs - or - a great first step into signing for young children. Available only on DVD. Includes sign review and special features. 16 amazing, original songs in this series teach and reinforce these 49 beginning signs: eat - drink - cracker - water - cereal - milk - banana - juice - finished - mom - grandma - dad - grandpa - diaper - potty - more - bird - fish - cat - dog - horse - frog - hurt - where - baby - shoe - sock - hat - coat - please - thank you - sorry - car - train - bus - bike - airplane - boat - ball - doll - bear - wash hands - soap - sleep - bath - brush teeth - book - pajamas - blanket. Developed to reinforce all the signs taught in Signing Time Volume 1: My First Signs, but can also be used on its own. Beautiful photographs, illustrations, and simple sign descriptions will keep you and your little one entertained as you continue to build your ASL vocabulary and develop word recognition through this easy-to-use format. Spot Hopkins throughout the book! Signs included are: Eat - Milk - Water - Ball - More - Bird - Dog - Cat - Fish - Car - Airplane - Want - Shoes - Flower - Mom - Dad - Baby - Sleep - Finished. Developed to reinforce all the signs taught in Signing Time Volume 2: Playtime Signs, but can also be used on its own. Signs included are: Friend - Play - Train - Doll - Bike - Bear - Please - Share - Your Turn - My Turn - Book - Read - Socks - Yes - No - Drink - Thirsty - Dirty - Clean - Potty - Bath - Hurt - Sorry - Stop - Go - Wait - Wash Hands - Thank You - Grandma - Grandpa. Developed to reinforce all the signs taught in Signing Time Volume 3: Everyday Signs, but can also be used on its own. Beautiful photographs, illustrations, and simple sign descriptions will keep you and your little one entertained as you continue to build your ASL vocabulary and develop word recognition through this easy-to-use format. Spot Hopkins throughout the book! Signs included are: Hungry - Apple - Cookie - Cereal - Banana - Bread - Chesse - Cracker - Ice Cream - Candy - Help - Full - Hot - Cold - Dry - Wet - Like - Don't Like - Day - Sun - Night - Moon - Stars - Happy - Laugh - Sad - Cry - Boy - Girl. Volume One - My First Signs: Eat - Milk - Water - Ball - More - Bird - Dog - Cat - Fish - Car - Airplane - Want - Shoes - Flower - Mom - Dad - Baby - Sleep - Finished. Volume Two - Playtime Signs: Play - Train - Doll - Bike - Bear - Please - Share - Your Turn - My Turn - Book - Read - Socks - Yes - No - Drink - Thirsty - Dirty - Clean - Potty - Bath - Hurt - Sorry - Stop - Go - Wait - Wash Hands - Thank You - Grandma - Grandpa. Volume Three - Everyday Signs: Friend - Play - Train - Doll - Bike - Bear - Please - Share - Your Turn - My Turn - Book - Read - Socks - Yes - No - Drink - Thirsty - Dirty - Clean - Potty - Bath - Hurt - Sorry - Stop - Go - Wait - Wash Hands - Thank You - Grandma - Grandpa. This full-color wall poster set contains 36 individual 8 ½ x 11 inch posters that show you how to sign each letter of the alphabet in American Sign Language plus the numbers 1-10. Printed on fade-resistant 100# gloss paper, these colorful posters are perfect for displaying the ASL manual alphabet and numbers. The full-color photographs of Rachel’s hands clearly demonstrate the correct way to sign each letter and each number. For each letter and number there is also a display of the written equivalent. These posters are perfect for classrooms, preschools, daycares, waiting rooms, or even bedrooms. If you’d prefer you could also put them into a standard 8.5x 11” binder to use as a visual aid in group settings. You can display each letter and number in sequence to show the entire alphabet – or you can use them to create words (B-I-R-D, C-A-T etc.) for special bulletin board displays. This wall poster set makes a great gift for teachers! Animal Signs and Word Signs include charming, full-color photographs of basic animals and first signs plus illustrations of their corresponding signs offer children ages 1 to 4 a fun way to learn their first signs and vocabulary words. Constructed of sturdy cardboard with a protective finish on each page, this hearty book will withstand the hard use to which fascinated young children will subject it, reading it again and again. A Book of Colors depicts the charming character with the favorite hat signing all of the primary and secondary colors—red, yellow, blue, orange, green, and purple—in interesting settings. The other pages display a wide variety of appealing colors, too, including pink, white, black, gray, brown, and tan, topped off with a richly rendered illustration of a rainbow. 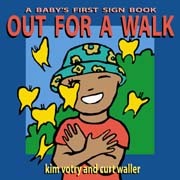 Out for a Walk offers toddlers their first look at signs for the world around them. As they follow our distinctively hatted youngster on a stroll, they encounter familiar animals and insects, among them a dog, cat, butterfly, and squirrel, and learn which ones can be pets. They’ll enjoy imaginative images of the senses, too—sight, smell, hearing, taste, and touch. Printed on robust cardboard stock, these delightful full-color books will engage toddlers in new topics as they discover more basic signs, proven to accelerate their grasp of language. This book features over 500 fundamental signs of great appeal to young children & concise instructions on how to sign, including the importance of facial expression. This book is a great resource to have on hand when you want to know the sign for a word that is appropriate for your child.